The American Medical Women’s Association advocates to bring under-addressed issues to the forefront of the national agenda. 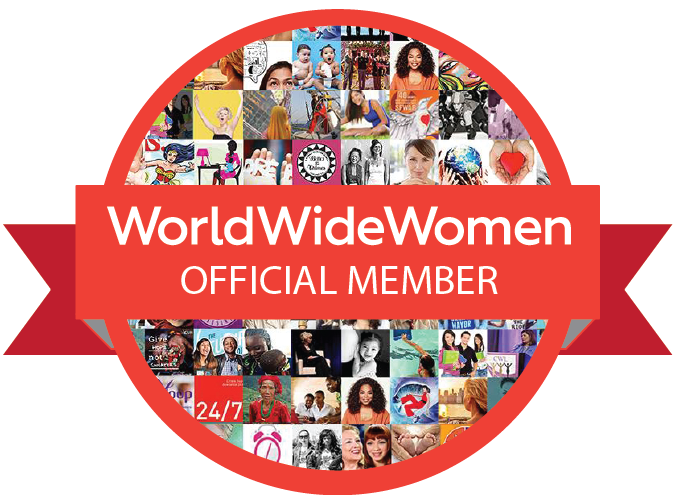 Join our initiatives now. Precision medicine has been a buzzword in health care circles for years now – but the National Institutes of Health (NIH) is poised to launch a major new research effort that will make it a reality. 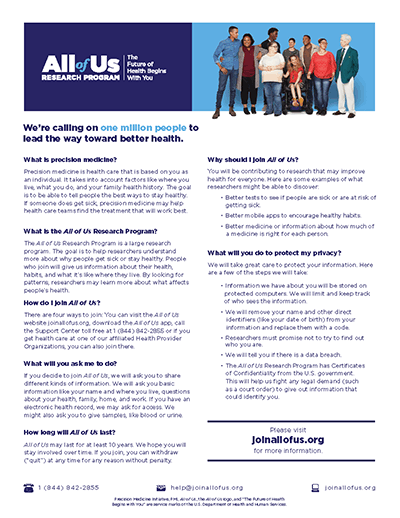 The All of Us Research Program seeks to enroll one million or more participants who will share their health information and begin a new era in medical research and treatment. Two major goals set this NIH effort apart from typical medical research. First, they aim to have 50 percent of participants from racial and ethnic minority communities. Second, they aim to have 75 percent of participants from groups that have been historically underrepresented in research. Achieving these goals will require significant effort to build trust, overcome barriers, and work with participants as true partners in research. 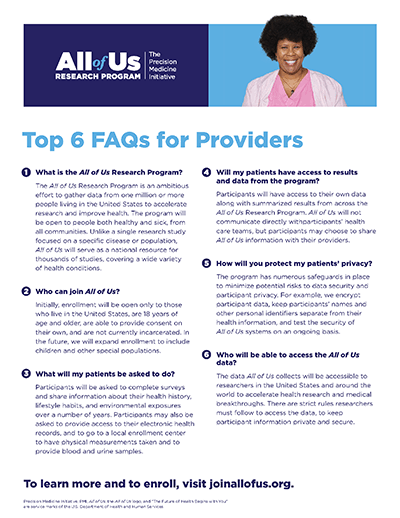 The All of Us Research Program is not one single health study; it will be a database that researchers can use to run thousands of health studies. The data collected can be used by any researcher in the US and around the world, as long as they follow strict privacy and security rules. We hope that researchers will use this data to achieve a wide range of medical breakthroughs. Health care providers have a critical role to play in this effort. 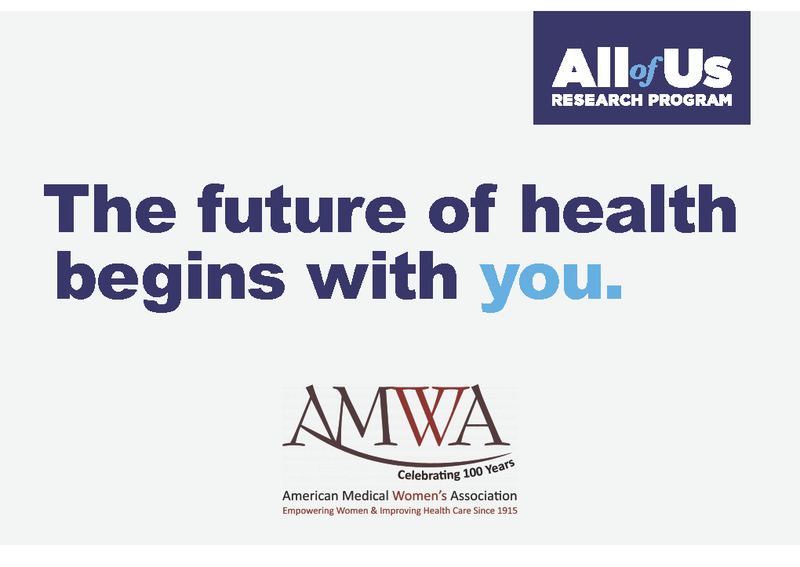 Based on our commitment to reducing health disparities, expanding participation in clinical research, and increasing access to health care, AMWA is excited to help spread the word about this program and ensure that our members are educated about its promise and accomplishments over time. 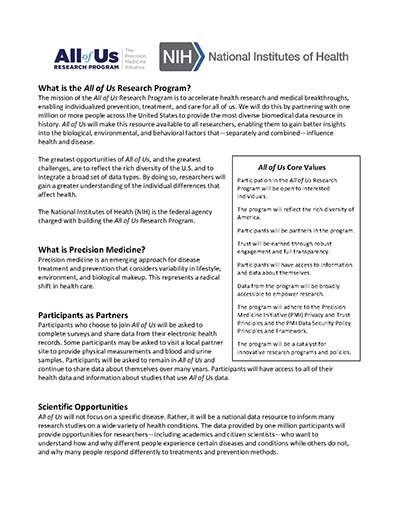 You may also learn more about the program, including what it means to be a participant, by visiting the NIH “All of Us” website.